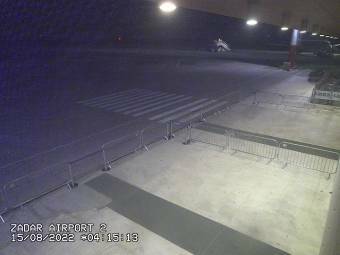 It's 03:17 in Zadar, Croatia right now. Zadar Airport Several views of the airport of Zadar. Zadar: Livestream Rowing club Jadran, 0 miles away. Zadar: Zadar - Bridge, 0 miles away. Zadar: Livestream Roman Forum, 0 miles away. Zadar: Narodni Trg (People's Square), 0 miles away. Zadar: Trg Petra Zoranića, 0 miles away. Zadar: Marina Borik, 0 miles away. Nin: Livestream Beach, 9.1 miles away. Nin: Knez Branimir, 9.1 miles away.